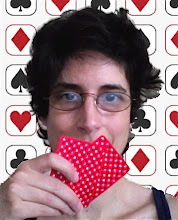 Raise or Fold: Learning (From) Poker: I take it back. I often quip that no-one runs like Forrest Gump, but I'm not the cards. I wonder what positives you can draw from dwelling on bad beats? Is it like looking at your hole cards when everyone folds to you in the BB? Railing you in the 50/50....must be frustrating to see all those players giving their chips away with bottom pairs as you sit and fold, and fold, and fold. Good luck.